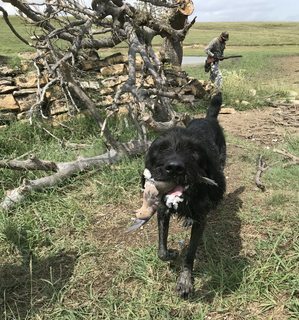 VersatileDogs.com • View topic - Hunting Seasons are Under Way! Hunting Seasons are Under Way! 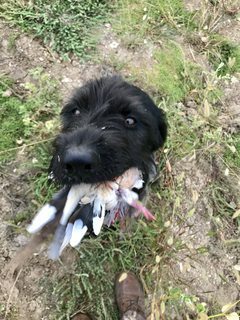 My Brother, Spud and I hunted doves between the rains for a couple of days. 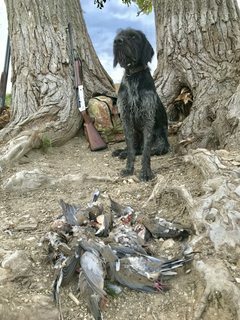 Spud got to retrieve 4 limits, hard to beat doves for giving a dog alot of retrieving action. Wish the site had not changed the photo size limit. This is the largest I can get to post. Spud Bringing me my Brother's Bird. My Benelli Legacy 28 gauge and Spud striking a stately pose. Re: Hunting Seasons are Under Way! Nice work AG. 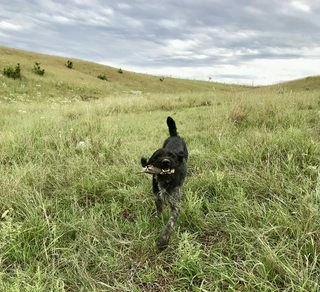 Nothing like a good dove hunt to get both man and dogs mojo on after a long offseason! I was wondering who would draw first blood...shoulda known it would be you. The local military camp conducted the annual three day sharptailed grouse hunt, and despite the rainy weather, we had two sharptails on the ground in ten minutes on Saturday. Then yesterday , we visited the local release site, and took the first pheasants of the year. 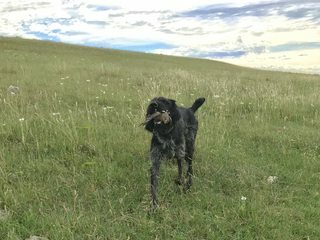 From now on, the plan is to hunt at least three days per week for the next three months or so, between pheasant, Hungarian partridge and sharptails. Nice work as always! Love that Spud dog. I was "this" close to getting a dog from Kelly, but opted to put a deposit on another shorthair. I really like his dogs and especially Spud. Rolled in at midnight last night after 17 hours of driving. Coolers and gear unloaded this morning. Had an over the top experience with bugling, glunking, fighting, breeding bulls ending with one well placed arrow. Never gets old. Onto the Whitetails and the Birds now. Forrest, The arrow was placed through the lungs and the bull immediately staggered 30 yards and went down dead. Dang nice job AG! That main beam looks hefty. Thank you. It was a Blessed experience start to finish. Had bulls within 5, 10, 28 yards and on out from there. Saw mule deer, pronghorn, merriams, rio grande turkeys, gambels quail, mearns quail, teal, road runners, coopers hawk, prairie falcon, kestrels, golden eagle, rattlesnakes, coyote, bear sign but no bears, javelina, (what did I forget). Yes, that bull was old and going down hill with excellent mass and fronts. He was the dominate bull of the elk that were all around him and fighting another bull when he paused to catch his breath and I sent an arrow his way. 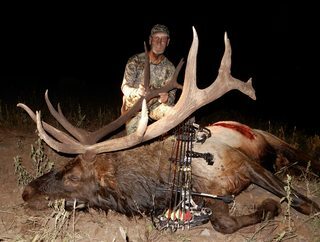 Excellent bull to take after passing younger bulls with higher scoring antlers. 360 quarts coolers full of meat and memories for a lifetime. Awesome experience. Did you use a guide, and public or private land? I'm going to try it soon and NM is one State I'd like to go.